I’m off to join some friends for church and brunch, followed by dinner with more. I have been promised tremendous amounts of ham. And chocolate. The good news is Lola had fun discovering her Easter basket this morning. Not as much fun as she had finding it yesterday. 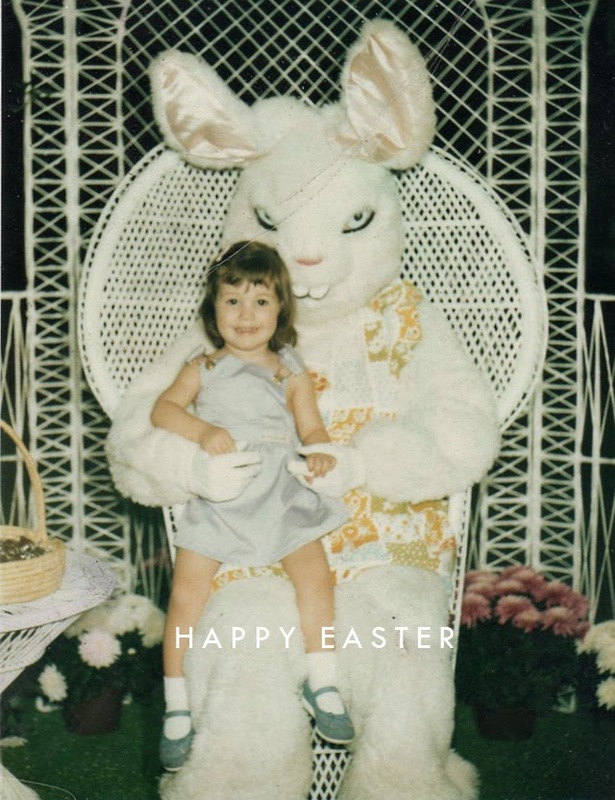 Hope everyone is enjoying themselves at home, eating their weight in chocolate bunnies. 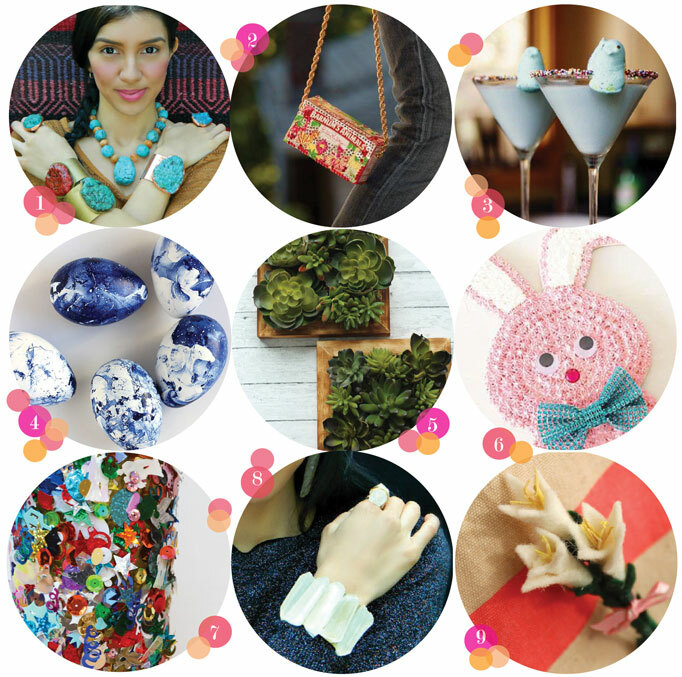 If you are cruising the interwebs for a fun project, or maybe filing away ideas for next Easter, these nine will keep you busy! 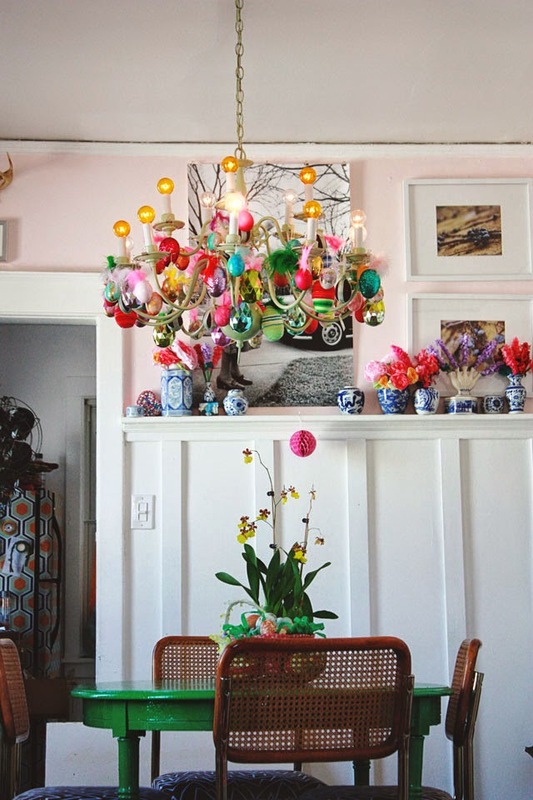 Have you seen any exciting DIYs on the internet this week? Share a link in the comments! 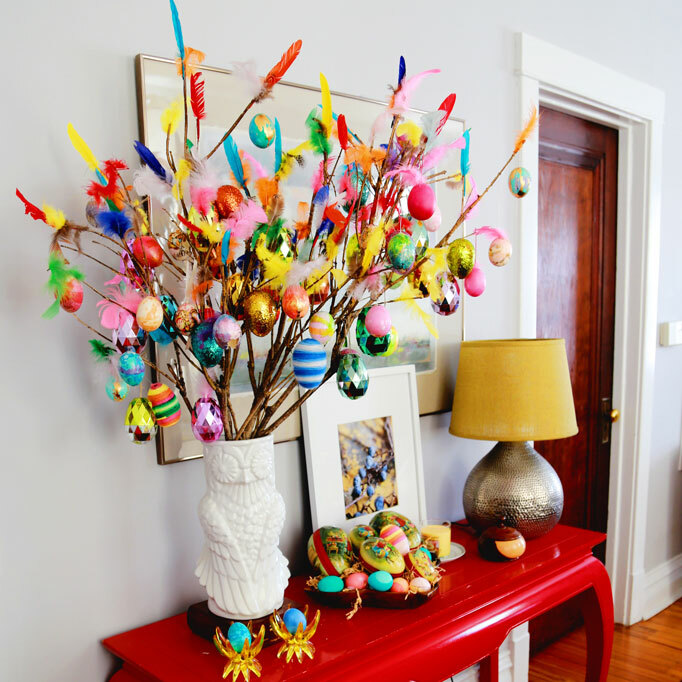 Every year I try to find new and interesting ways to display Easter eggs. 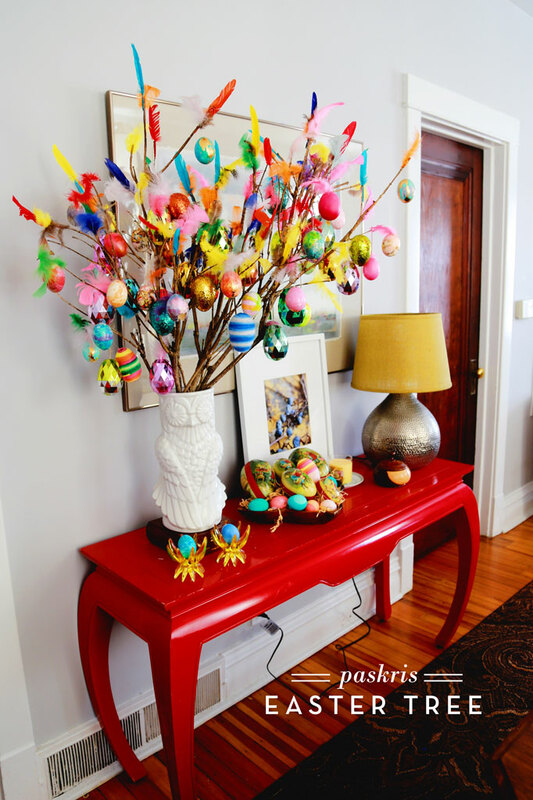 My favorite will always be the old Paskris tree, but there is something to be said for a humble hard-boiled egg that deserves a place of honor. 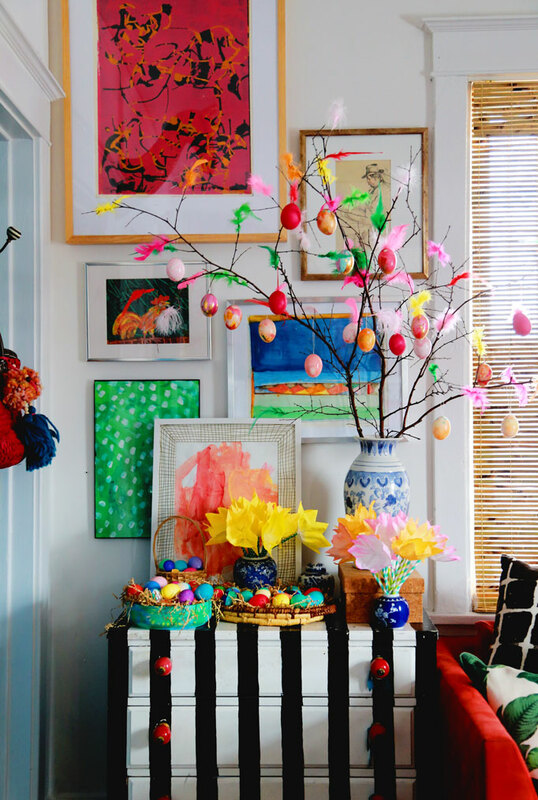 Not that I don’t love a colorful jumble of eggs in a basket, but you know, sometimes you have an egg who deserves a shot at a solo career, up on the mantel with the other treasures. 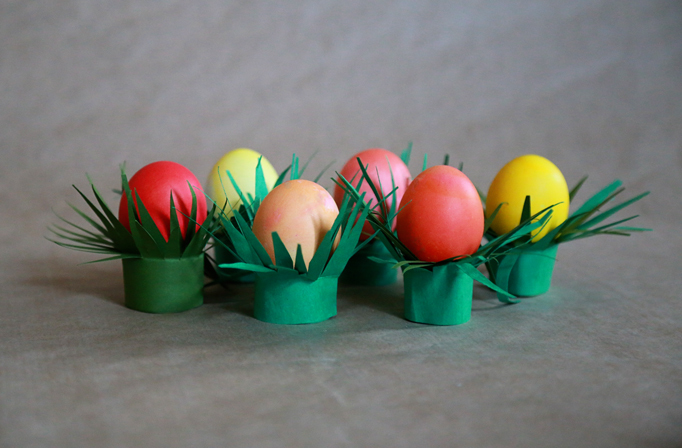 Paper grass and Easter eggs are old friends, so this just seemed like a natural combo! Best part? They are crazy easy to make. All you need is an 8.5″ by 3.6″ piece of paper (that’s one third of a standard letter size sheet) with fringes cut 2/3 of the way down. 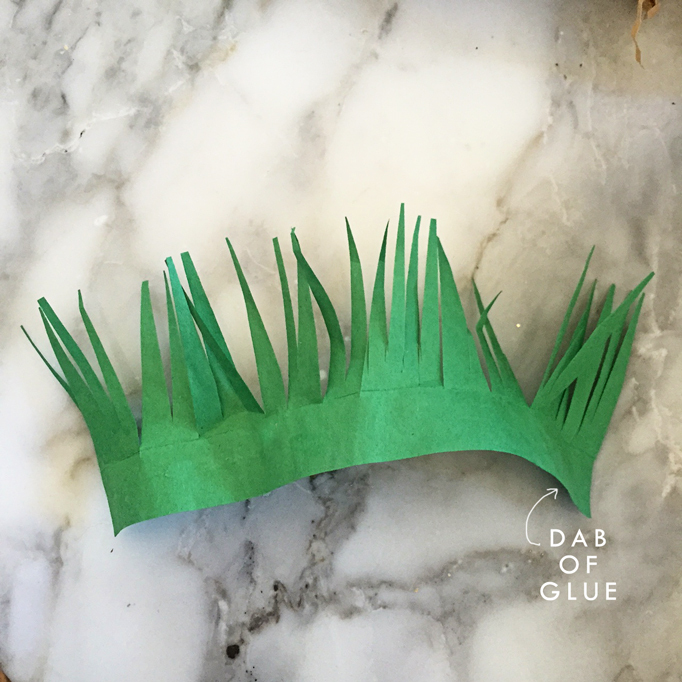 Now fold back the fringes, circle it around a couple of times and dab with glue. Presto! Grass eggs at your service. 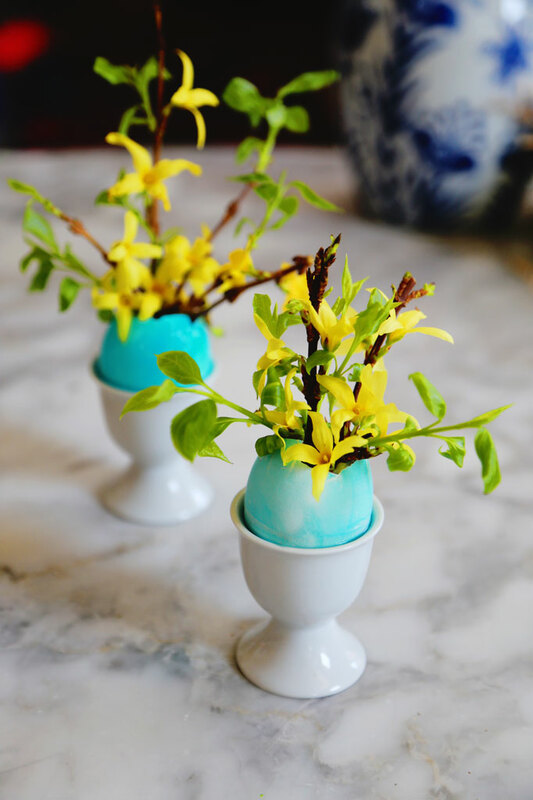 You can make one to display a single egg, or make a whole bunch and then it will look like you are trying to grow a garden of Easter eggs (don’t act like you aren’t). 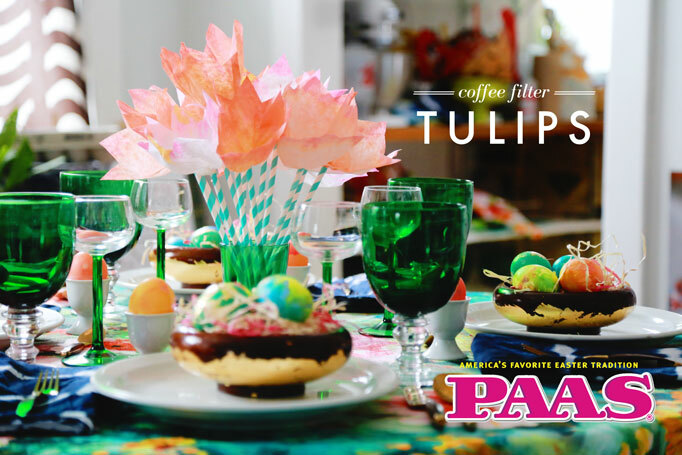 As always, this post is brought to you by Paas, America’s favorite Easter tradition. Go see some of the amazing eggs they are cooking up on Facebook (like these fancy eggs I made with their Flashy Foil kit). Yeah, cool huh?! I am a late-life clothespin convert. We spent many years apart, but now I can’t get enough of them. Literally. Every time I see a big pack of them at the store (usually for under a dollar) I just get them because I know I will use them for everything but laundry. Craft projects. In the office. In the pantry. In the basement. On my fridge…everywhere. 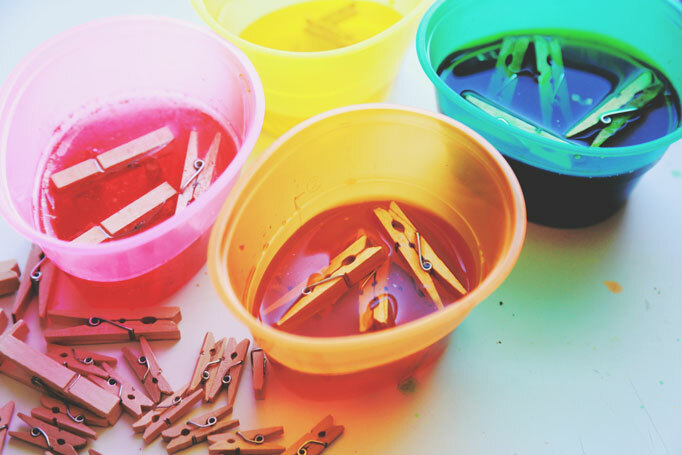 And while there is nothing wrong with a humble wooden clothespin, I like to dress them up with a bit of dye. Now, can you think of a time of year when you have small quantites of dye laying around with nothing to do? Oh yeah. 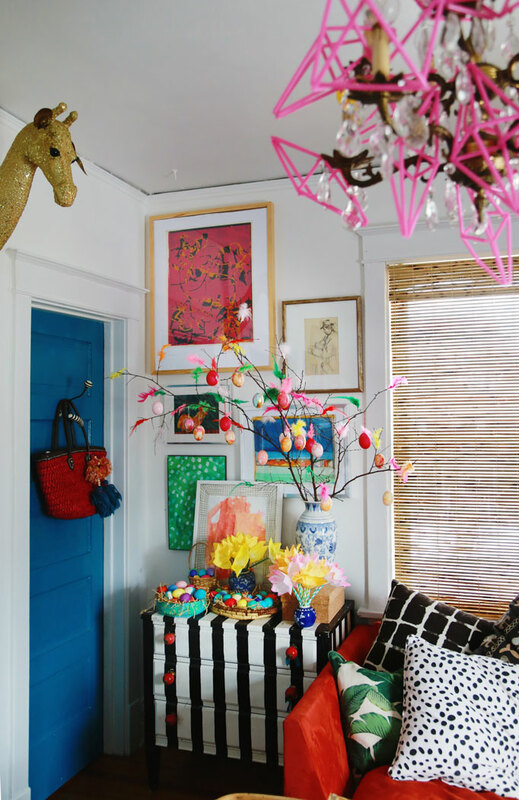 Hello, Easter eggs! And hey now – if you use food-safe dye, you can use the clips on food. 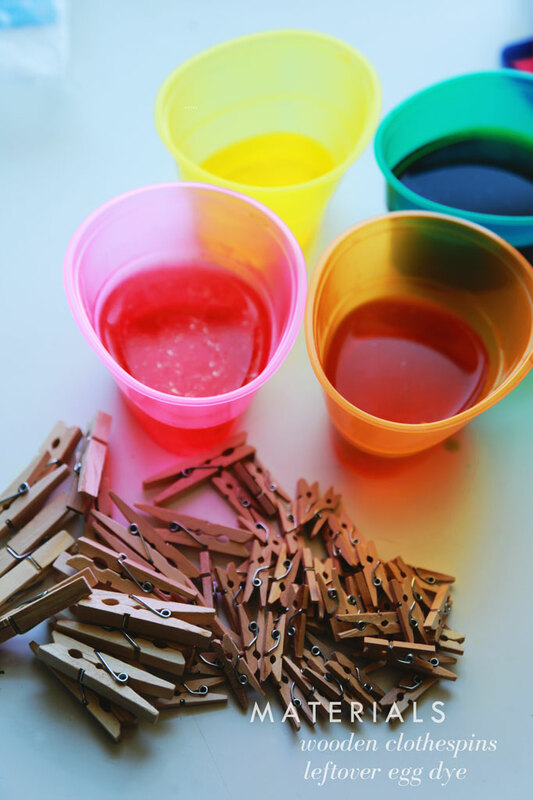 Here I used those teensy clothespins as drink markers. 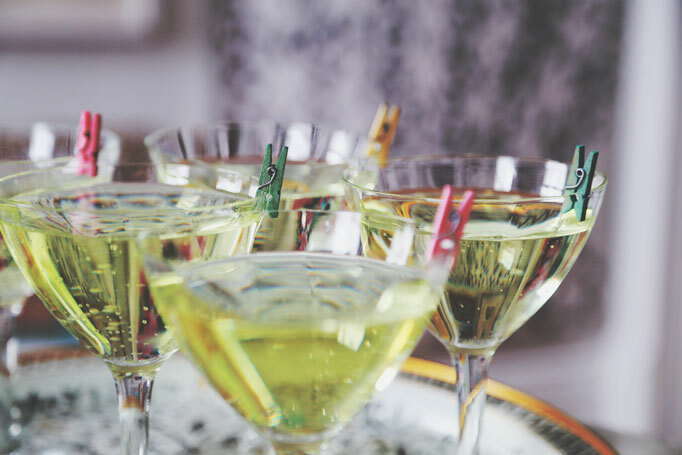 Make a bunch in different colors and clip them onto glasses before your next party – now everyone will be able to spot their drink in the crowd. Works just as well on wine glasses as it does on red plastic cups. They also work great on paper plates and double as a nifty way to keep paper napkins in place when it comes to eating outdoors. 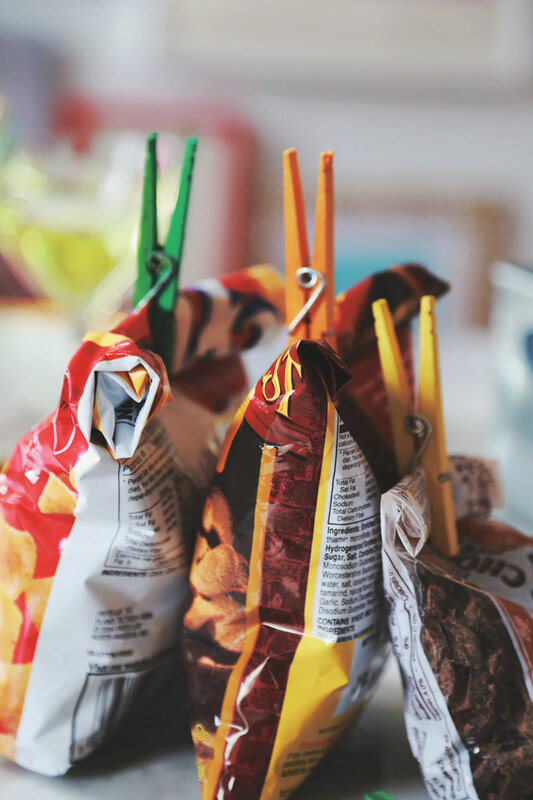 You can also use them in place of those chip clips that people pay good money for. Seriously, why pay $2 for a single chip clip when you can buy 80 clothespins for that same price? Stop the madness! Lay them out to dry on a paper towel to dry, and whamo! You’re in business. 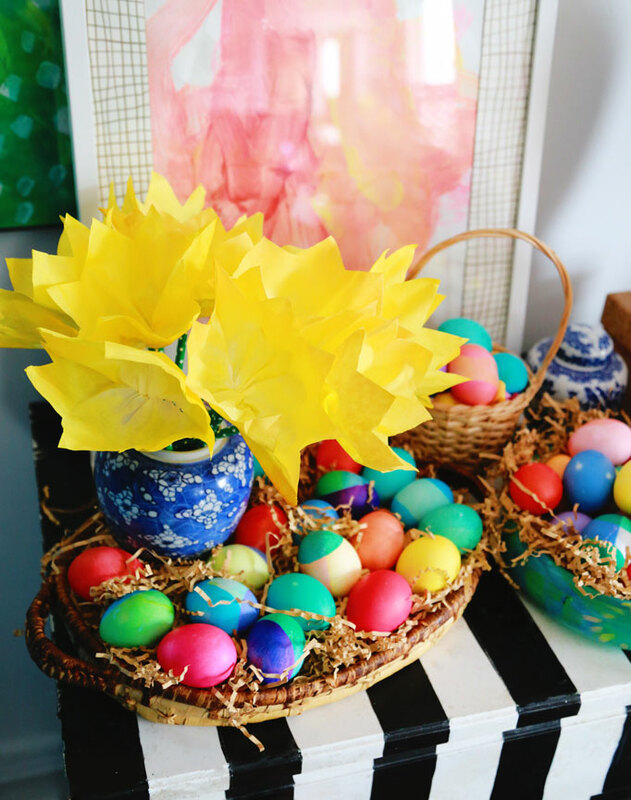 Not a bad way to double up on that leftover Easter egg dye, huh? 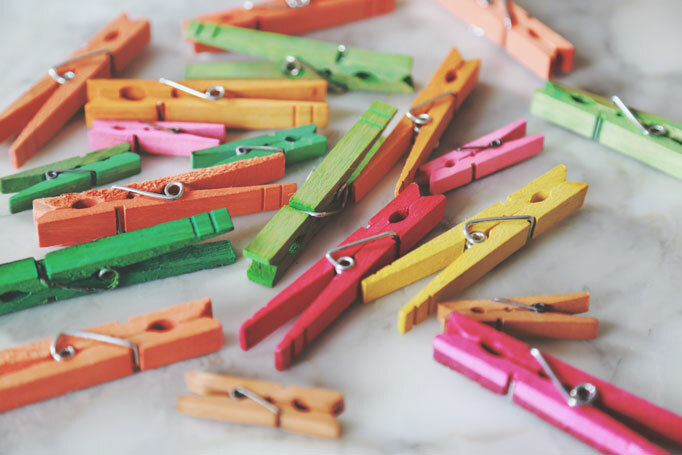 Do you have any interesting ways you like to use clothespins? Let me know. I would love to hear! 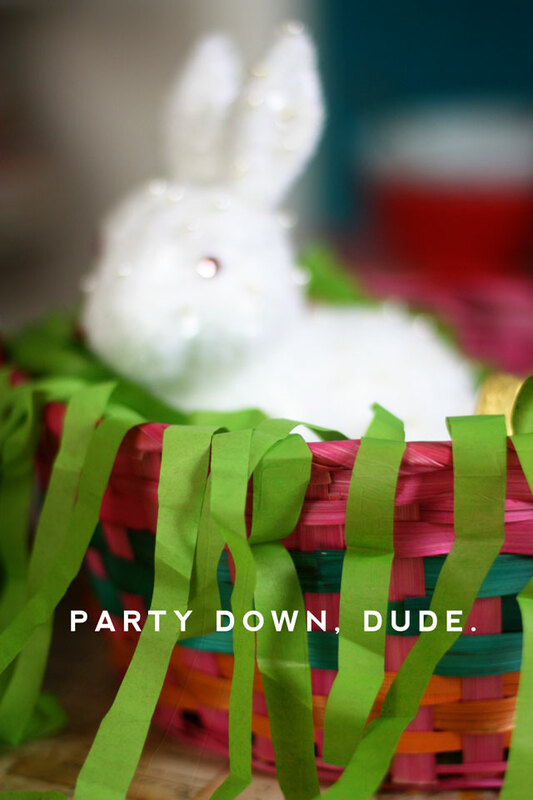 This post is brought to you by Paas, America’s favorite Easter tradition. Be sure to check them out on Facebook and see all the other cool things you can do with Paas! We are going on four months of snow on the ground outside, so I’m thinking it’s high time we bust out a can of spring inside. Don’t you? 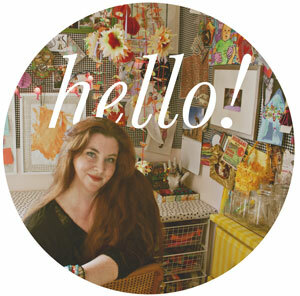 Since we are still a good month away from daffodil season, why not make our own flowers? And, good news! I have a secret way of doing it that is ridiculously easy, costs less than $10, and will make you feel accomplished all weekend while you binge watch House of Cards. Don’t even act like you are not watching it. I saw you. For this project, I am partnering with Paas. This is especially appropriate because the first thing I ever dyed with my own two little hands was an Easter egg using Paas tablets and that little copper wire dipper dooby (<< real word) . 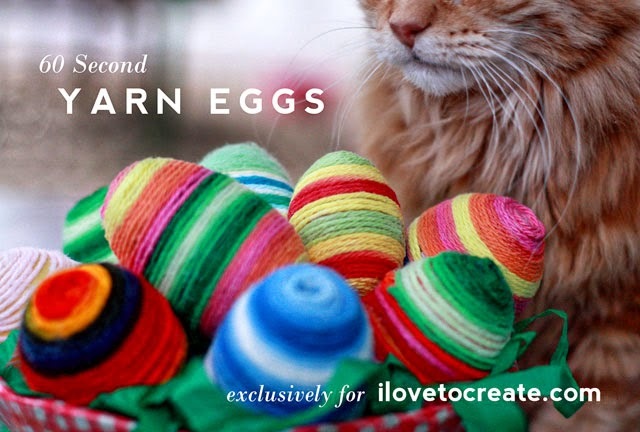 Even back then, after the eggs were all dyed up and looking pretty, it occurred to me that there ought to be something else you could do with all that leftover dye. Thirty years later, I have the answer. I have it! 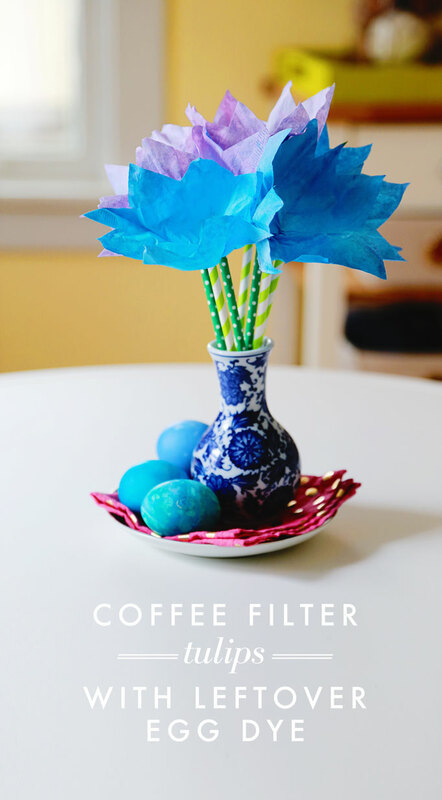 Coffee filter flowers are not new to me or this blog, but this is the first time I have made them using the flat kind of filters, which I understand, is the standard filter outside the US. So for all y’all who have been looking for a flat filter flower craft, here you go! Anywhere that would sell straws for smoothies or milkshakes is great. Ikea has some for pretty cheap, and I have found many healthy food stores carry them too. There is a place that has lots of extra tall, extra wide green straws that may-or-may-not sell these things called “Slurpies” (registered trademark here). I won’t say what the place name is, but it starts with “seven” and end with “eleven.” Now, would *never* encourage anyone to go there and take their straws for free, but, I have found that if you make an effort to buy something there, and ask the clerk nicely, they aren’t going to mind if you grab a few extras. Now, I know a lot of you do these as a class craft, or part of a group-lead activity, in which case you probably want A LOT more straws than that, in which case, you can find wide green straws online for not a lot of money, but they may take a while to deliver (these will take a good month to ship from Latvia). I didn’t explain this in the video because this can be as easy or as complicated as you want it, and it mostly depends on quantity. Coffee filter fibers do not hold liquid, so it’s easier than you think. Normally I just leave them in stacks of 5-10 then flop them over my shower rod to dry over night. 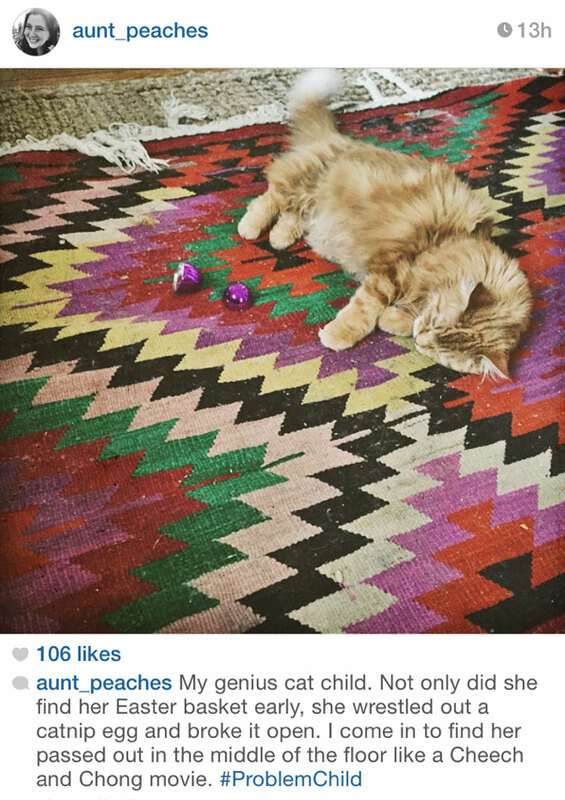 If you are working with impatient munchkin types, that can be a little more difficult. Want them dry in a hurry? Two options: If your total quantity is under 10 or so, lay them on a dishtowel on a cookie sheet and pop in the oven at 225f for about 10 minutes. You may need to shuffle them around half way, depending on the size of your cookie sheet. If you are working with a larger quantity, let them set on towels for a few minutes to get the excess liquid, then throw them in a warm dryer for ten minutes. I would suggest keeping separate loads for warm colors and cool colors, but sometimes the colors bleeding on each other is pretty nifty, so yeah, that’s your call. It doesn’t take much effort to dry them off, it just depends on timing. 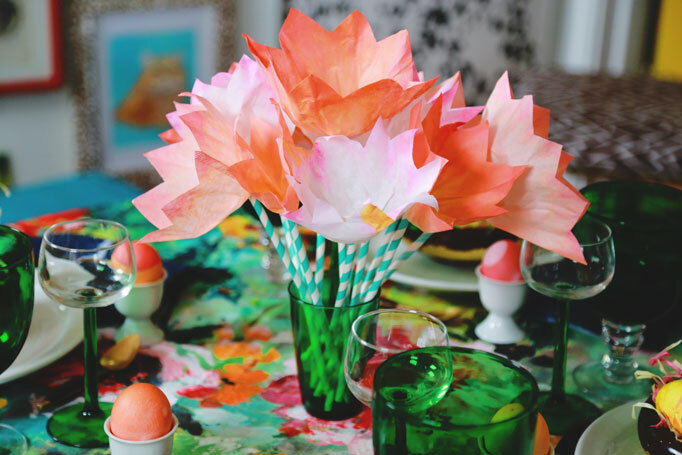 Look, the tulips match the eggs! Is that the most darling thing you have ever seen? And the Tulips will year round. The eggs…not so much. Speaking of eggs, I’ll be partnering with Paas on a series of projects this spring, so be sure to stop by and keep tabs on the fun. 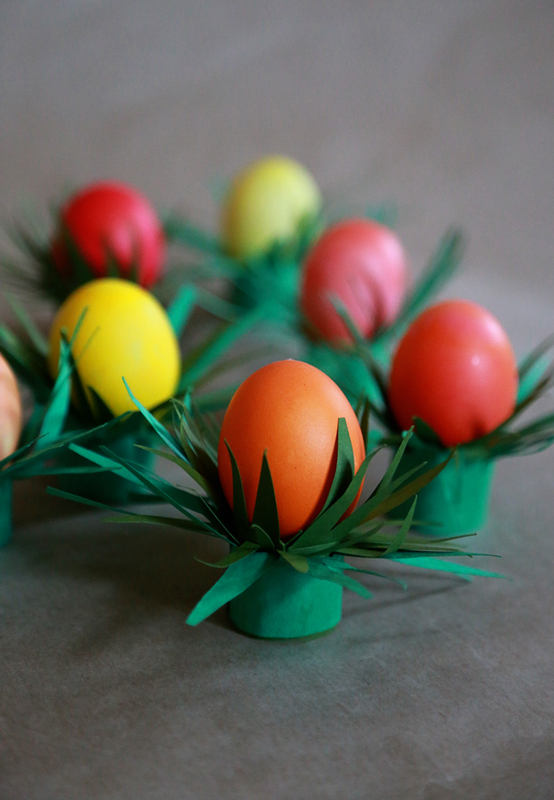 If you make these tulips with your eggs, post a picture to their Facebook page so everyone can see your work. I’ll be looking! Thank you to Paas for sponsoring this post, and thank YOU for supporting the brands that make this blog possible. Not gonna lie, it’s been a rough week. 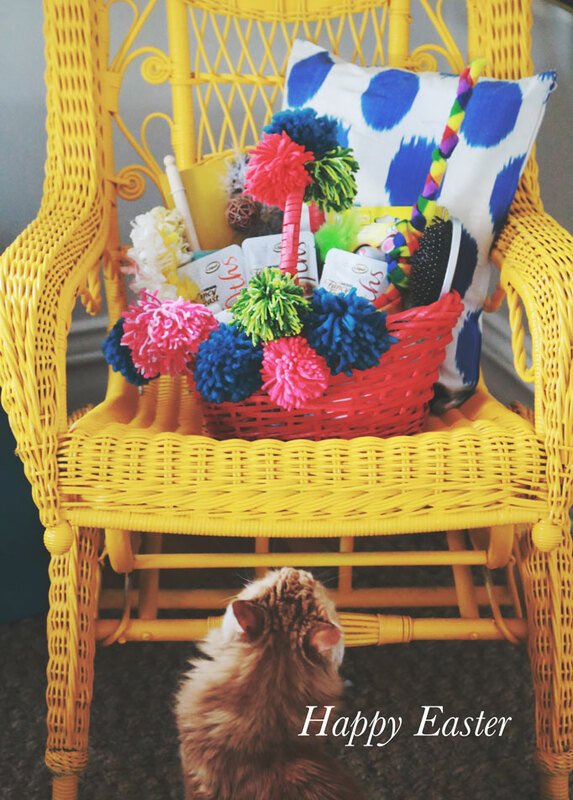 If there was ever time to be thankful for a holiday weekend riddled with candy and furry things…this would be it. The good news is Spring is here, the magnolias are peeping their heads, and decapitating that chocolate bunny with my teeth felt damn good. 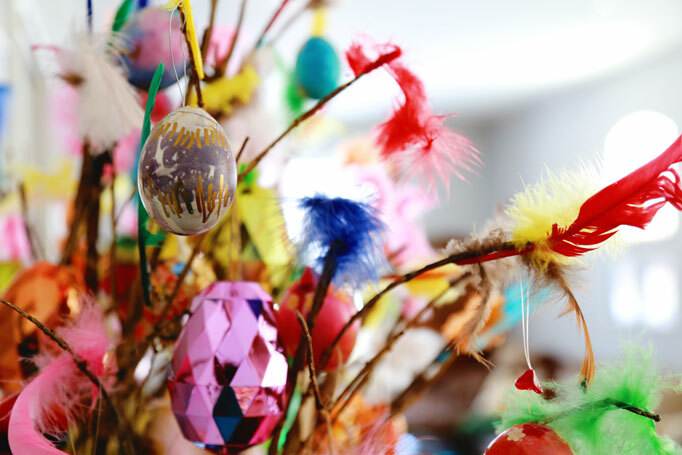 Time’s Top 10 Things you didn’t know about Easter (Sweden’s Easter witches alone are worth the read). 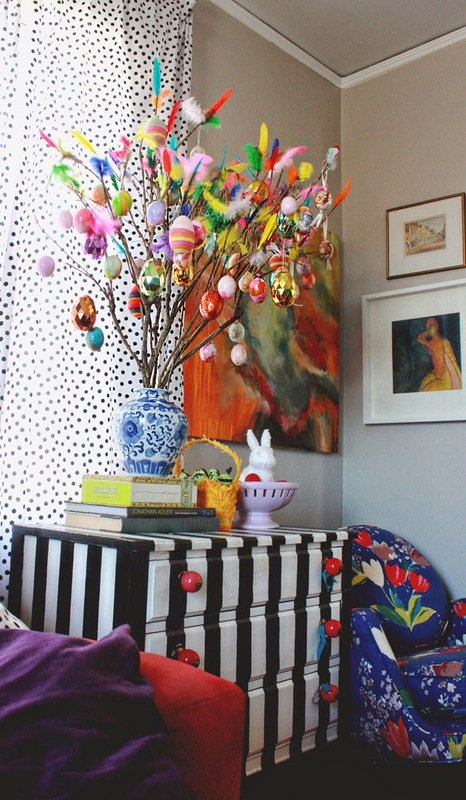 David Sedaris reads his thoughts on the meaning of Easter. Might be the best essay has written to date. 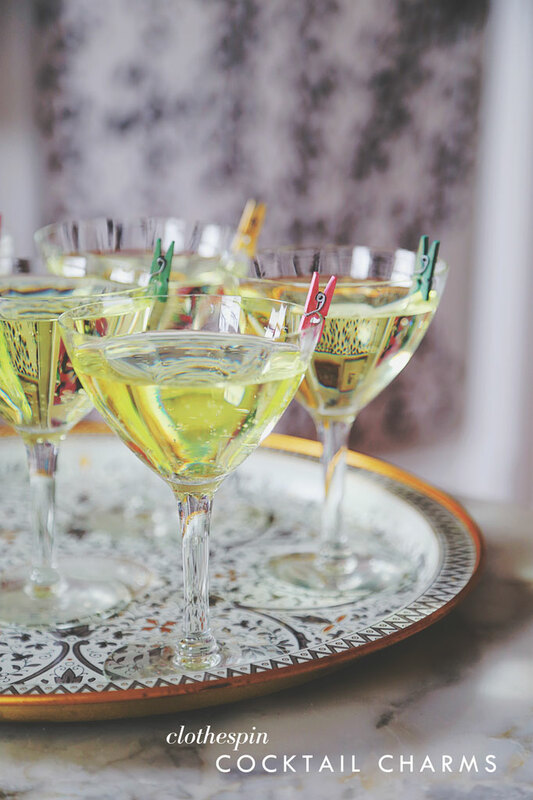 Love this idea of a moonlit egg hunt for adults (fill eggs with booze and/or cash — that’ll get people going). Easter cakes you won’t see in the social room after church. 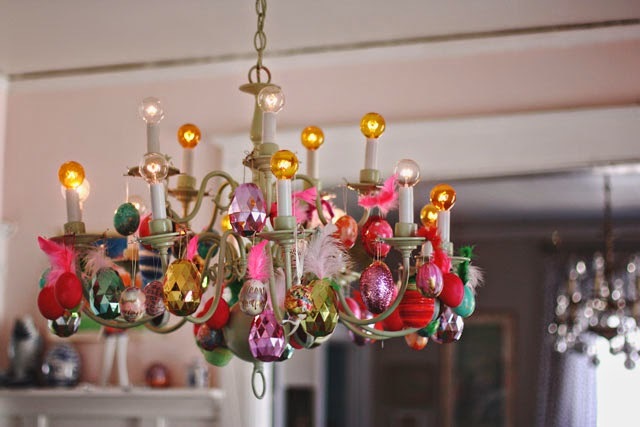 The Easter bunny dropped by last weekend, leaving a feathered path of Swedish sparkleyness in his wake. The Paskris went up again this year, albeit a little smaller than before. I don’t know if this is because I’m feeling a little less Easter, a little less Swedish, or because I still have to wear my winter coat outside in April, and I’m justifiably ticked about that. Either way, it feels slightly springier in here and I’m down with that. Not just eggs folks; eggs with feathers. I swear, feathers make everything better. Don’t ask me why, I don’t make the rules, they just do. 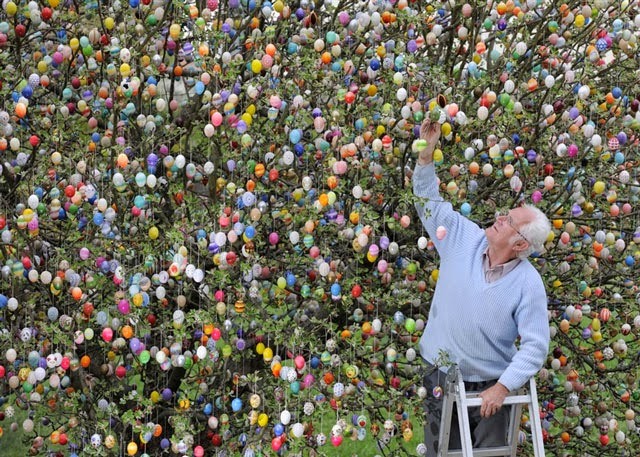 Back to the Easter tree. 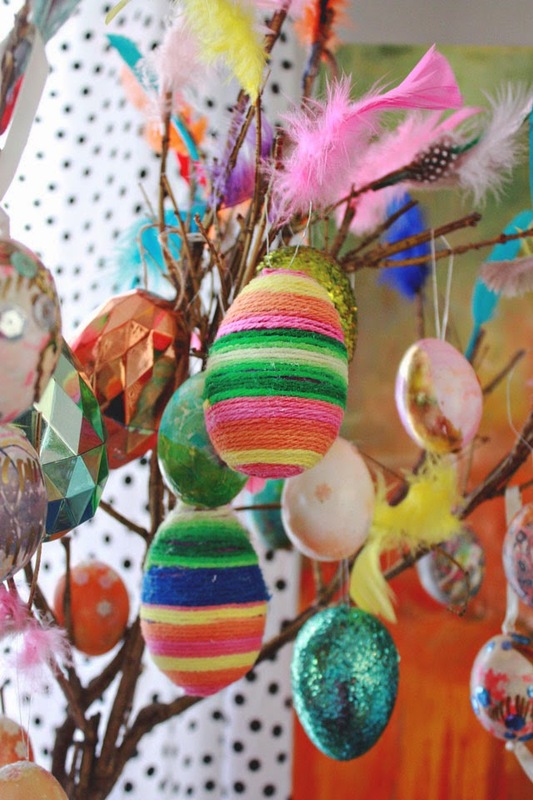 These yarn eggs I made look surprisingly nifty on the tree, as well as off. I’m pretty pleased with how it all came out. I’ll confess here, I’d be more pleased if this crazy German dude quit making my tree look like a poorly Charlie Brown tree, but I can be the bigger person. Kudos to you crazy German dude, Kudos to you. A couple Sundays ago, Heidi came over for an afternoon craft session. There was yarn. There was glue. There was fun. Lola would like you to know that she helped too. 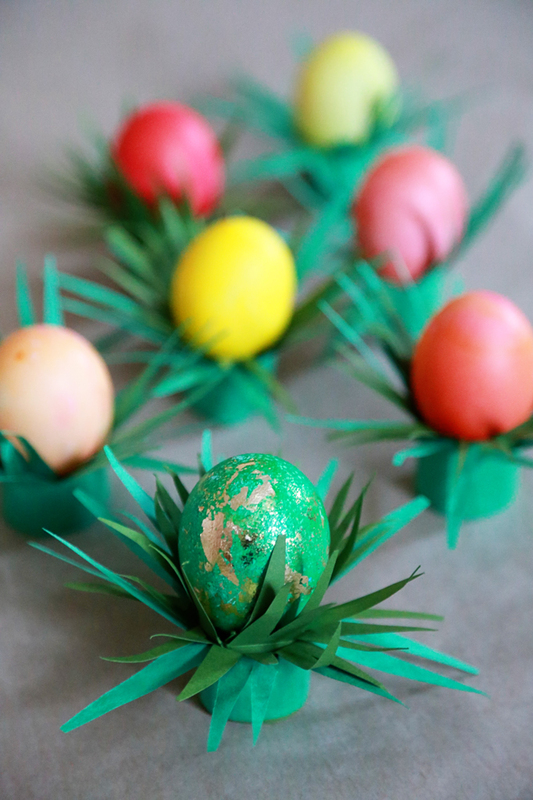 Is it weird to post an Easter craft on Saint Patrick’s day like this? I don’t think Saint Patrick would mind. I’m not entirely sure what leprechaun’s think of Easter eggs, but I’m pretty sure they would approve. I suspect, if a unicorn could lay eggs, I’m pretty sure this is what they would look like. I’m not sure that leprechauns and unicorns are best buds but they both hang out by rainbows, and, for a good two years in the 80’s there was a unicorn on the cover of Lucky Charms cereal boxes, and that makes them Irish for sure. Lá Fhéile Pádraig Sona Daoibh, Unicorns! So, I was talking to my friend Amy week about what she was putting in her kiddo’s Easters baskets. 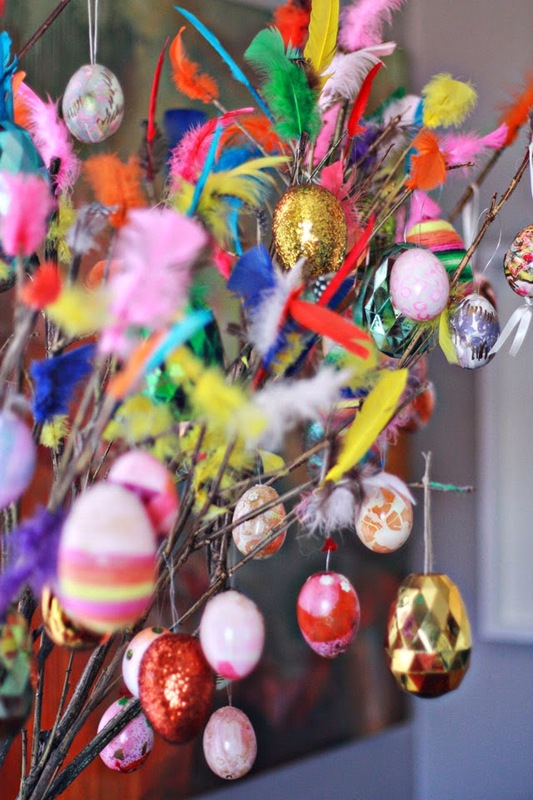 She says this and that and a whiz-bang-whatsit…and then she drops a bomb: No Easter Grass. 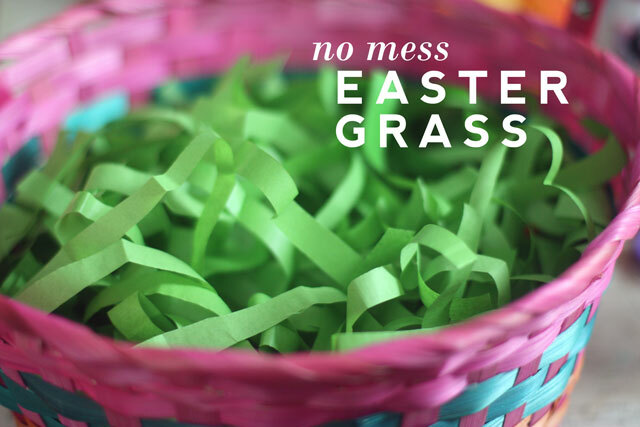 Amy runs a no Easter grass household. Amy is a neatknick. Nobody gets to wear shoes in her house and her get kids get grassless baskets. She’s practically Joseph Stalin. Did you hear me? NO GRASS. So I says, I says, Why? I says, But it’s Easter. How is the bunny going to roost in the basket with no grass? She says, Bunnies don’t roost. Besides, I don’t give them bunnies. Too much chocolate. The kids get a few small toys and some snack bags with crackers and fruit chews. Just fold it up a bunch of times and leave the middle inch open, then slice a bunch of fringes and stuff. The middle seam will keep it together so you just plop it in the basket. Oh, errrr, here, I’ll just take pictures and write a blog post about it. See, by leaving the middle seam in tact, all the grassy string bits will stay connected. No mess. Just one big octopus plop of tissue paper. Or newspaper. Or old wrapping paper. Or whatever. It will all stay together nice and neat. Your cat won’t get a chance to eat it. Your kids won’t get it caught in their hair. Your Easter bunny will have a nice and kooshy place to setup while waiting for the celebrations Easter morning. And Amy, that bunny is totally roosting.